Hayes Valley is one of those San Francisco neighborhoods that I rarely venture to, and I really don’t know why. It’s a lovely neighborhood, and happens to be chock-full of restaurants. When I found out that Destino serves grilled beef hearts, it’s all I needed to hear to make the trek to this cute little restaurant on Market Street. Destino serves Latin American tapas with an emphasis on Peruvian cuisine, all of which I’m crazy about. Service is friendly and prompt here, and our group’s dishes began rolling in only a few minutes after our order. 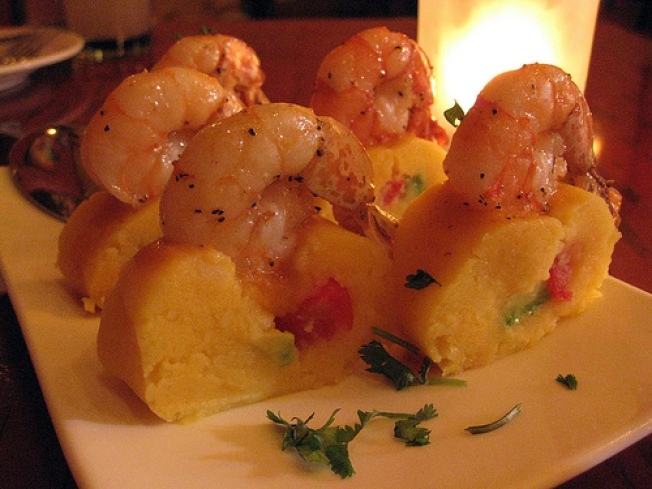 We started with the causa con picante de camarones. A Peruvian potato torte topped with tiger prawns and spicy prawn reduction sauce, the torte was colder than expected but the shrimp were juicy and succulent. “Picante” might be a relative term here, though, since the shrimp weren’t very spicy. Next came the filet de bacalao and arroz de acietunas. The black cod was encrusted with plantains and served alongside olive rice, toasted almonds and aji amarillo salsa. The cod was incredible: subtly seasoned and cooked to perfection. The aji amarillo provided a nice kick of heat. Our third dish was the Peruvian chicken empanada. How can you not order empanadas when you see them on them menu? Unfortunately, we were pretty disappointed in this dish. The empanada was undercooked and the filling was pretty flavorless. Even the sauce on the side couldn’t save it. Our next order to arrive was the one I had been most looking forward to: anticuchos de corazon. Anticuchos de corazon, or grilled beef hearts, are one of my favorite foods and here they were served with an aji panca reduction, green garlic and Peruvian choclo. Choclo, or large Andean corn, is hard to come by and they were a good accompaniment to the hearts. The grilled hearts themselves a little overcooked and the sauce overpowered them, but the pickled onion topping was wonderful. Our next dish was the churrasco. The grilled sirloin was topped with a chimichurri salsa and Maldon sea salt; simple and cooked just right. This was my favorite dish of the evening, and the chimichurri provided just the right kick of spice to the beef. But we weren’t done yet. Our sixth tapa was the chile relleno. Stuffed with ground sirloin and cheddar cheese and topped with chipotle salsa and citrus crème fraiche, the chile relleno was smoky and hearty. Despite so many different flavors happening in one dish, it really worked. We ended our meal on a sweet note with the banana bread pudding. You can’t really go wrong with caramelized bananas and caramel sauce, and the pecan crunch was a nice touch too. The pudding was moist and even though I’m not a big fan of desserts, I was all over this one. Destino’s menu can be hit or miss but the food is imaginative and the ambiance is worth the visit. Just make sure to factor in extra time to look for parking, which can be difficult to find. Which reminds me, maybe that’s why I don’t go to Hayes Valley all that often.